Since Jacquie has been here before, I immediately knew I wanted to ask her to guest post for me again when I was lining them up to share while I am on vacation! I'm so happy she agreed! 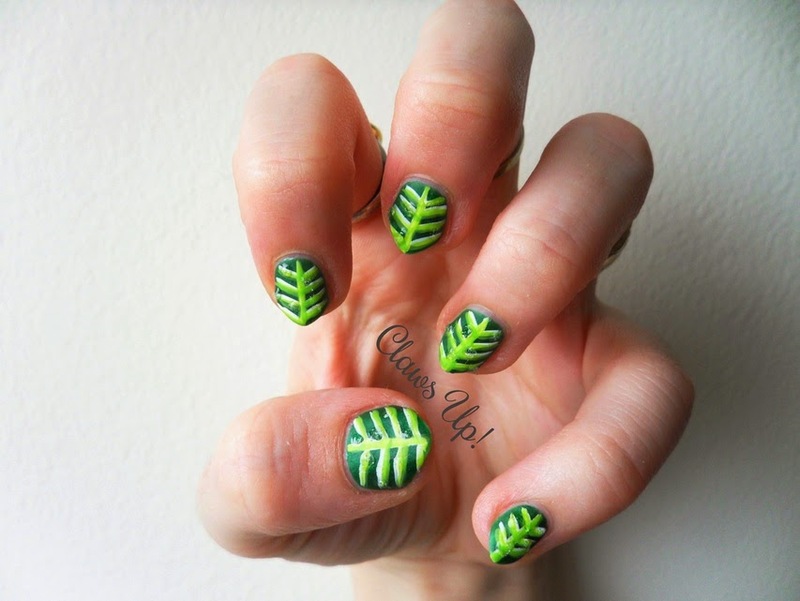 Let's see the mani she created for us today! Hello lovely followers of Nails like Lace! My name is Jacquie, but I go by Littlemonsterx14 on the blogosphere, of the blog Claws Up. I am super excited to be guest posting for Amber. This actually isn't my first time at the rodeo, I guest posted for Amber a long time ago [here]. That was back when I had only been blogging for a month, and luckily my nail skills have improved since then. For my post, I wanted to do something that I have been thinking about for a while. I have really wanted to try a morning dew look. I had tried a dew look a while back, probably around the same time I did my last guest post here, but of course it was an utter fail. This time I finally think I cracked the code! 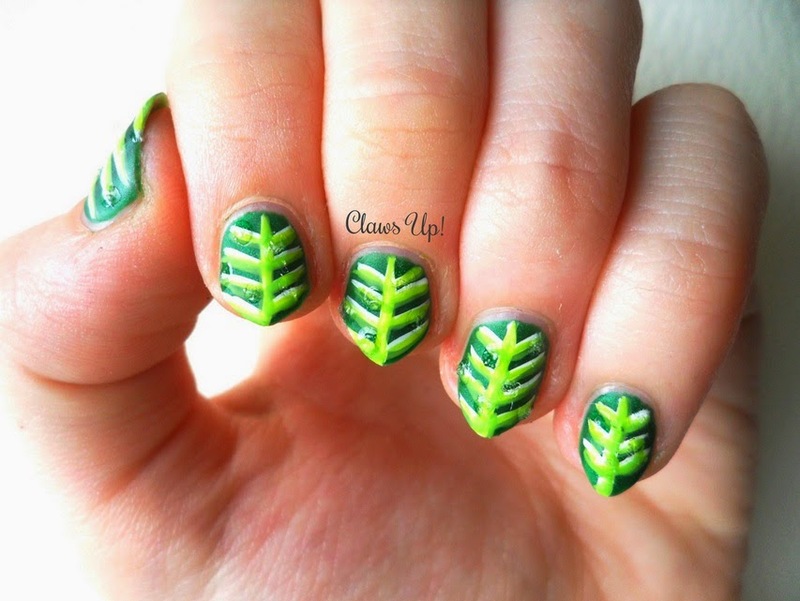 I decided to go for a leafy look. 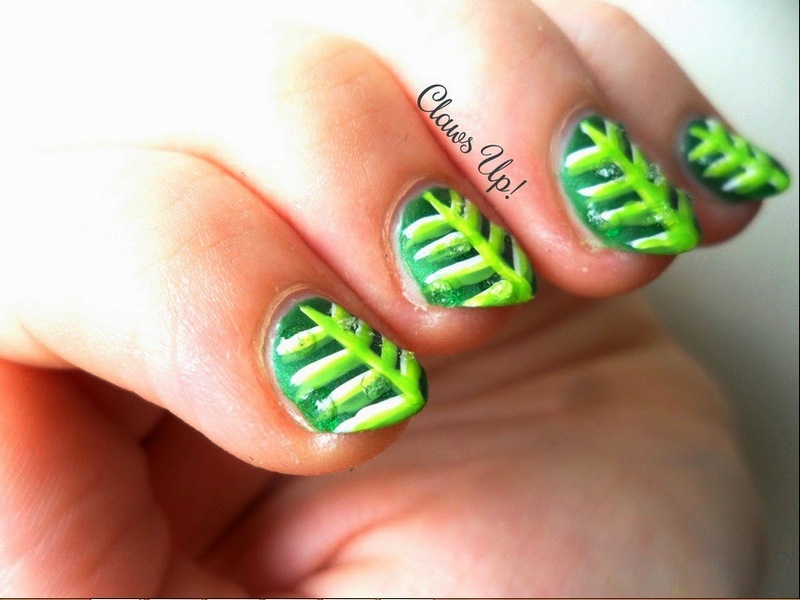 After painting on my leaves, I went over everything with a matte top coat. Once that dried, I used a really thick and gloopy old top coat to make little dew drops. It's a little hard to see in the photos, but it was a really neat effect in person. I also love the texture it created! 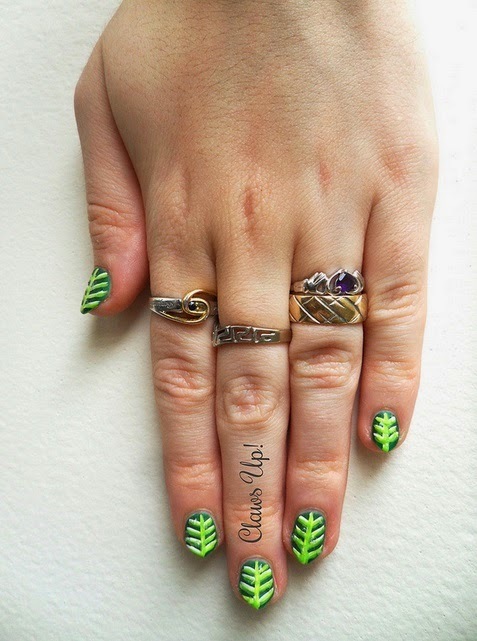 I was really excited about how my dewy leaves came out, and I am even more excited to share it on Amber's blog. Thanks again for welcoming me back on Nails Like Lace! What do you think of my dewy leaf look? Aren't they cute!? I love them! And I am pretty envious of Jacquie's nail shape, I wish I had the guts to pull it off!! Don't forget to come back in a couple of days for this week's Twinsie Tuesday! I was able to go ahead and get that post done and scheduled!